As a result of our extensive automobile crash safety experience, ARCCA was recently contacted by TV’s Inside Edition to demonstrate the hazards associated with wheels falling off of a vehicle – the dangerous consequences of which are obvious. A wheel separation while driving can be the result of several mechanisms. A lug nut or bolt backing off the lug studs or brake rotor is the most common type of wheel separation failure we see at ARCCA and results most often from the lug nuts not being properly reinstalled after a vehicle is serviced. After driving several miles, the improperly torqued nuts can eventually back off the lug stud, and the wheel can and will separate completely from the vehicle. Other scenarios include a wheel bearing or suspension component failure which causes the entire wheel/rotor/hub assembly to collapse and separate from the vehicle. One of the most dangerous consequences of wheel separation occurs when the wheel itself becomes a projectile into surrounding traffic. A wheel and tire combination carries a significant amount of energy at highway speeds and can become a hazardous projectile, striking oncoming vehicles and/or pedestrians. Serious injuries and fatalities have occurred as a result. Another equally significant consequence is loss of control of the vehicle in question. When no significant steering authority is possible, the driver can lose control when the vehicle has lost one of its wheels. Crashes and rollovers are foreseeable after loss of control, as well as impacts with other vehicles. The missing wheel corner can also become a trip mechanism for rollovers when brake rotor and other suspension components impact the roadway surface. 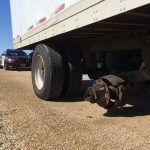 The network asked Michael Markushewski, a Crashworthiness Engineer at ARCCA, to demonstrate some of the hazards associated with potential wheel separation. Utilizing an SUV as the test vehicle, he deliberately loosened the left front wheel lug nuts to set the stage for an impending wheel separation. The vehicle was driven at low speed on a test track to demonstrate how the vehicle would behave under those conditions. The next test involved the removal of four of the five lug nuts and loosening the fifth. In a low-speed controlled environment, the wheel ultimately separated from the vehicle and became trapped under the left front fender as the vehicle was slowed to a stop. MICHAEL MARKUSHEWSKI is a Crashworthiness Expert, Chief Technical Officer, Vice President and Principal of ARCCA Incorporated. In addition to being the Director of the Failure Analysis group his areas of expertise include occupant crash protection, restraint system design and injury tolerance.